Menachem Mendel has already noted the publication of Yirmiyahu Malchi's collection of articles on Rashi's Talmud commentary. I haven't been able to check yet whether any of the chapters are new, but in any case it's an important new tool for studying the travails of a major medieval book. And Shai (thanking MM) mentioned Yuval Harari's new book on magic. I thought I would just add one more, also published by Mosad Bialik, on behalf of Ben Gurion University of the Negev Press - three new works by Moses ibn Tibbon (belated hattip to R Eliezer Brodt of the Seforim blog). This 13th century scion of the famous family of translators and philosophers has received a fair amount of attention in recent years, with his commentary on Shir ha-Shirim published recently in German translation. Colette Sirat announced long ago her intention of publishing his commentary on Talmudic aggadah, included in this volume (Sefer ha-Peah). 13th century Southern France produced a number of interesting commentaries on Talmudic aggadah as part of its grappling with philosophy, rationalism and allegory. One that has received some attention is that of R Isaac ben Yedaiah, as described by Marc Saperstein in 'Decoding the Rabbis'. R Menahem Meiri, everyone's favourite rationalist rabbi, did his fair share of explaining away weird aggadot. Saperstein also described the aggadic commentaries of Yedaiah ha-Penini (who wrote on a wider swath of compositions - Menahem Kahana in his doctorate praises the textual virtues of his citations of Sifre Numbers in his commentary ad loc). I'm curious to see which sugyot Moses ibn Tibbon chose. Avraham Israel recently published Moses' commentary on Solomon ibn Gabirol's Azharot as part of his MA thesis, and it is included in the new volume. 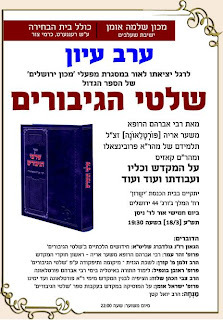 And Howard Kreisel, his advisor, seems to have published Sefer ha-Taninim. But I don't know anything about that. To be clear - this is not the famous Shilte ha-Gibborim by R Joshua Boaz. This is a book (only part of it, actually) devoted to the realia of the Temple and related topics, written by an Italian doctor in the 17th century. The book was published during his lifetime. But in recent years it has attracted the attention of Jewish Temple enthusiasts, who have devoted considerable time and effort to publishing a new edition. Targum Shlishi provided both general support and funding for the development of a CD-ROM to document the Taylor-Schechter Genizah Collection at Cambridge University Library. The collection includes 140,000 centuries-old fragments of Hebrew and Jewish literature and documents recovered from the Ben Ezra Synagogue in Cairo in the late 1800s. Despite the great promise of the project and interest in it, the CD-ROM was never completed. The Cambridge faculty’s focus was of a scholarly nature; bringing the Geniza Collection to the public was not a priority, which contributed to the abandonment of the project.